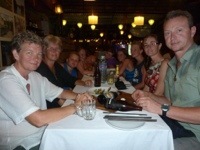 Tonight was our last night in Hoi An with our newest friends the awesome-12-months-away-English backpacking family. Tomorrow morning they head off via train to Quang Ngai (not sure how to correctly pronounce that one) and we leave at 6.15pm to Nha Trang by overnight bus. 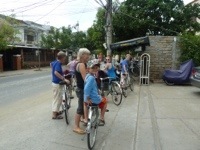 The overnight trains to Nha Trang were full, so our only option was bus. 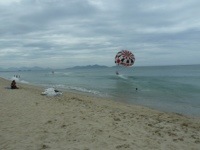 People shake their heads when we tell them how we’re getting to Nha Trang, even the Vietnamese. But it will be another interesting experience to add to our collection already (and most probably we will be a grumpy, sleep deprived family) at the end of it. 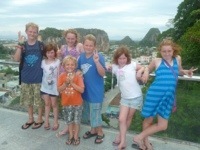 Only a couple of days ago we got into a minibus with another family, all 11 of us, and set off for a day tour to My Son and Marble Mountain just outside of Hoi An city. 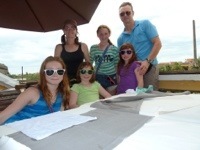 That’s part of what great traveling is all about – meeting other people along the way that you connect with and have something in common (many children and a passion for backing to wonderful far away lands), and you get to share a part of your journey together that lasts forever. 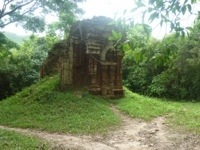 My Son is a jungle valley where stands the most extensive Cham remains built from the 4th century to the 13th century. 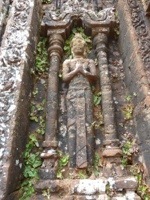 Many of the temples are in disrepair and many are being reconstructed after American bombings devastated the sites where VC armies were stationed and from jungle overgrowth over many centuries. 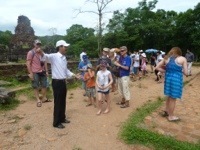 We hired a guide to explain and show us My Son and he was fantastic. 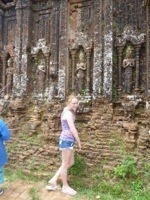 It reminded us a lot like Angkor Wat in Cambodia, except on a much smaller scale. 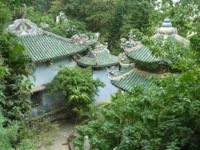 Only 20 of the 68 temples survived. 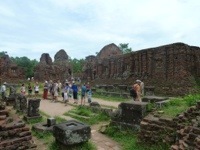 It really is quite thought provoking to stand at this site and see how this ancient civilisation built these temples out of bricks with no mortar so many centuries ago and then you see the impact of the bombs – deep, rounded craters that in the temples or nearby ground destroying such history in an instant. 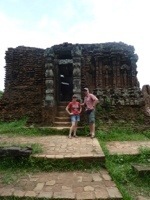 Well worth going to visit and the guide only cost $5 extra. 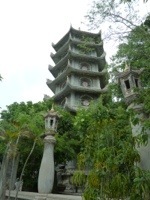 After that we got back into our minibus to enjoy some lunch and then visit Marble Mountain – consisting of 5 craggy marble mountains with pagodas on top. Each one apparently represents a natural element: water, wood, fire, metal/gold and earth. 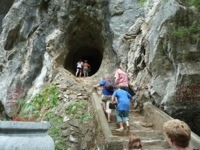 A massive glass elevator or stairs were on offer to reach the top of the mountain and visit some of the caves… yep, we all took the stairs!!! Nah only kidding…when Dacey got in the elevator she likened it to Charlie and the Chocolate Factory’s glass elevator. This one, however, stopped to let us out at the top! Great views of China Beach and the massive development taking place along this stretch of beach. 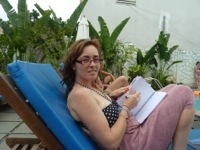 The girls will miss the fun swimming pool and card games and social interaction with the English boys. And Steve and I will miss the adult conversation with Francesca and Martina. Its been lovely having more parents around all the kids. We may or may not bump into each other again in our final southward bound journey to Ho Chi Minh City but we will definitely stay in contact with our new backpacking friends. We’ve been chatting about beginning a Start Running Group in Brighton, England for goodness sake! 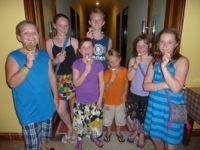 And this is the gang of kids who had a few dinners together, lots of fun in the pool and an ice-cream on the last night in Hoi An. Thanks guys it’s been great. Will miss you all. 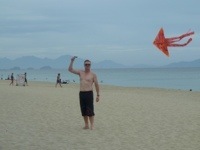 PS fingers crossed we catch up on Sunday night or Monday morning in Nha Trang. 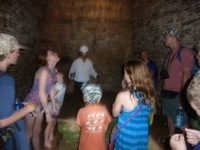 QUESTION: would you be okay if you got stuck in Hoi An? WHY? : because there is so much to do – shopping, snorkeling, cooking lessons, beach, parasailing, meeting amazing locals, riding bicycles, hiring scooters, playing pool, painting classes, making lanterns, visiting Buddhist temples, photography lessons, donating to amazing charities…the list goes on and on! Can you tell we just LOVE it here? 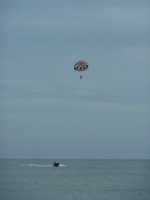 Did I mention beach parasailing? 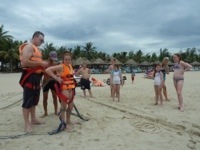 Yes we all had a go and it was ace! I was chicken at first, but after watching everyone else, including the English guys, go up successfully and happily, I decided to go with 6 year old Quinn. Our take off was a little rough but once up there you felt just like a bird. It was so quiet and peaceful all the way up there. When the boat turned around it shut down its motor and we floated down into he sea and then it started back up again and up we went into the sky. Lots of fun. PS we have discovered on this trip that both Billie and Dacey are absolute dare-devils. 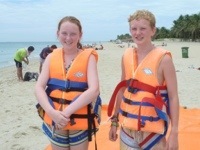 Thy went up parasailing together! 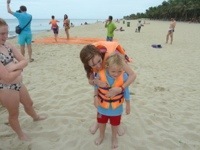 We went to Cua Dai beach for the day, about 4km from Hoi An town centre. 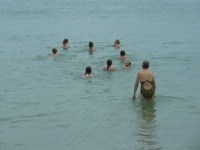 Some of us got bitten by jelly fish in the water but some ice fixed that up. 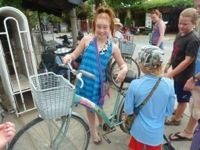 We hired bikes and had a ball. Billie and Dacey sit on the back seat of our bikes while the others ride on their own bike. The roads are for bikes, motorbikes, cars, trucks, buses and pedestrians. And amazingly, it works (somehow). I’m sure there are many road accidents but we have yet to see one. 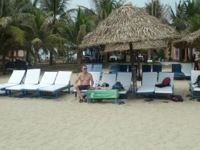 The beach is where Steve and I came to 13 years ago on our honeymoon adventure throughout South East Asia. The beach has transformed into a commercial reality of beach chairs (hundreds of them) and big hotels hugging the coastline. None of this was here 13 years ago. All there was was big shady palm trees and a quiet beach with women carrying around their fresh seafood and cooking it for you on the beach sand with coals. Most ex-pats here say the biggest growth has been in the last 5 years. This place is taking off. 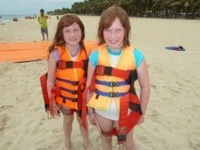 We enjoyed a lovely lunch of fresh prawn spring rolls while sitting on our chairs at the beach. Back to our hotel pool for more swimming (without the jelly fish) and the kids from Australia and England watched a movie together while Steve and took a stroll out to Dingo Deli for some couple time. PS we have just had a meeting with Kianh Foundation charity founder Jackie at the Dingo Deli. She has created a day centre for Vietnamese kids with down syndrome and cerebral palsy. Amazing woman from the UK and now living here with her adopted son who has a disability also. They are in need of teaching assistants for their classes and always need money to pay (and keep staff that they have trained up). Stay tuned we will update you further. You can check out her website at www.kianh.org.uk. Wonderful work Jackie. Today has been an off kind of day. Firstly it’s raining and actually feeling cold (although I could be used the hot conditions now) and secondly, the kids are driving us crazy. The first problem with the rain has been solved. The second, well…where do I start? It’s an ongoing issue around the areas of talking back, fighting with each other, crying, whinging, tiredness and more tears. 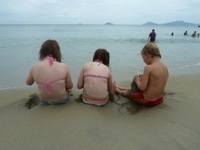 No matter where you are in the world or what you’re doing, kids will be kids. We ventured off this morning into the Old Town near the river going to the Cargo Club for a spot of French pastries, coffee and spiders (thanks for the tip Jenn from The Deli in Gisborne). The coffee was nice but not as good as yours! So far so good. 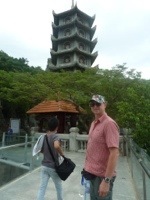 We have been avoiding the Western cafes trying to stick to more traditional Vietnamese places soaking up their culture and meeting interesting people. But today, I wanted easy. 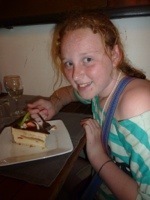 Here’s Charlie enjoying her cheesecake and our roof top seats overlooking the river until it rained. After sitting in a lovely Western environment that actually had wine glasses on the tables at lunch time, we got caught up with a lady on the street taking us up a little alley way promising us beautiful nails and feet for only 20,000 Dong. 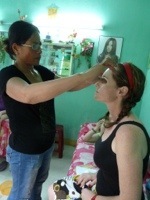 So when it rains in Hoi An we can recommend that you get some beauty treatments. I had some more treatments – eyebrows plucked and dead skin removed from my heels. Feels wonderfully indulgent after backpacking now for 2.5 weeks. Steve watched on for a while, until it drove him nuts and decided to go off and get more money out of the ATM and purchase himself a new large red backpack for $20! So now we are back at the hotel after eating deliciously fresh shrimp and pork Vietnamese spring rolls dipped in sauce at the local restaurant across the road. And if you’re wondering, the solution to the second problem, has been found with 2 kids in the pool and 2 kids out. Can you guess who’s missing out on the afternoons pool fun – A, B, C or D? Tonight at 7pm, we head to Kimmys tailors for our first clothes fitting. Steve is getting a cashmere suit and some business and casual shirts while the girls and I are dolling it up with silk dresses! Should be another interesting chapter. Keep you posted.